Not only do the images burn into the reader’s consciousness, but the simple words of the victims also make powerful statements about the very real horrors of war. The testimonies and the brief explanatory text are in English and Spanish. One of the people Mr. Dix and Ms. Fitzpatrick searched for and found was Felix Pedro Espinales Mendoza, whom Mr. Dix had photographed in 1987. The memories of a nighttime contra attack on his village still haunt him. “And there, my brother and I walk on top of the dead. 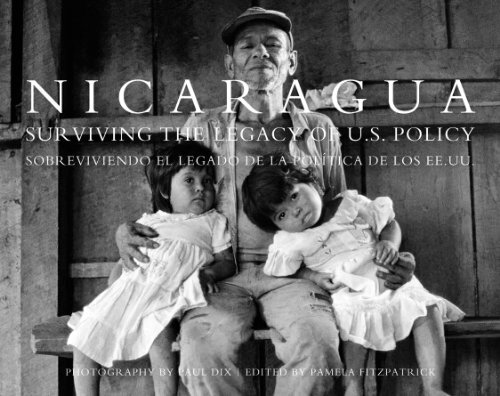 I touch the hands, I touch the blown-apart bodies, everything. . . . And only I, my brother, and a little girl, very young, survived the attack.” (Bocana de Paiwas, March 1, 2005). Dispersed throughout the black and white imagery are children’s drawings, sporadic bursts of color of houses on fire, bodies lying on the ground, and tears running down simple oval faces. This unique and riveting book belongs in every library across the Americas, on all the desks of foreign policy decisionmakers in Washington, and in the hands of human rights activists everywhere. Kathy Barber Hersh is a 30-year veteran of television and documentary production, including five years as a foreign correspondent for ABC News in Latin America. She devotes substantial time to youth advocacy and chaired a coalition that succeeded in introducing mandatory bullying prevention training in Florida public schools. She is also the author of the book, Protect Yourself From Crime, and has published widely in both magazines and newspapers. She covered the war in Nicaragua in 1978–1979 as a correspondent for ABC News; she also lived in Mexico for five years as a correspondent for ABC News.